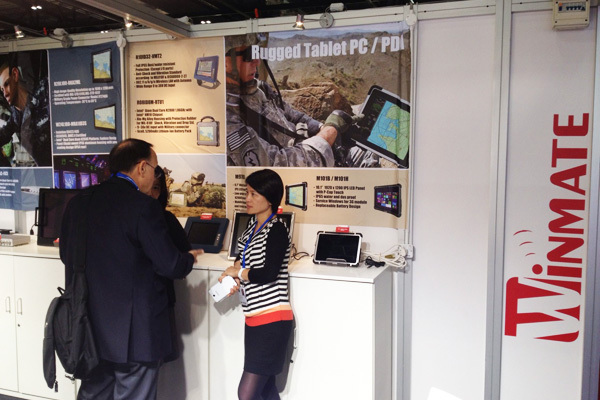 Winmate Communication INC., the leading rugged device provider, is introducing its latest military grade panel PC, tablet PC, and PDA in DSEI 2013, London. This year Winmate's booth is located at N10-122, which is near the Entrance N10 of the ExCel Exhibition Centre. Winmate has been providing military-grade devices with different panel sized for years. With special rugged design, our products can be widely used under extreme conditions of weather, shock and vibration, and endure rough handling. We are offering 24" Marine grade panel PC with DNV (Det Norske Veritas) certification. The product complies with DNV’s rules and standards for marine use. On the 7-inch form factor, we would like to introduce the M700DT4, an ARM-based tablet with Android 4.1 operating system. The tablet supports multi-touch function and is ideal for long-hour computing, especially in the harsh environment. In the Rugged PDA department, we have E430T PDA, a 4.3" ARM-based rugged PDA with optional Barcode reader and RFID reader. For more detailed product information, please visit Winmate’s website through the links below.